Technical mistakes and errors in judgement can be the cause of failures of rhinoplasty . A nose that is technically well done but that does not fit with the other components and with the individual's overall appearance should be considered as a failure. Technical faults vary in extent and can lead to deformities of the components of the nasal pyramid affecting not only the aesthetics but also the function of the nose. However , in cases in which the planned correction was successfully completed ,the surgeon was satisfyied with the immediate result - that is , no apparent technical error occured - minor defects can be observed in 5 to 20 % according to the surgeon . Sometimes these defects are exagerrated by the patient's unreasonnable expectations and minute scrutiny of the nose . A frequent example is the discrete deviations that are seldom noted before the operation but are always seen by the patient post operatively. Major defects may result from the excessive and irregular resections. 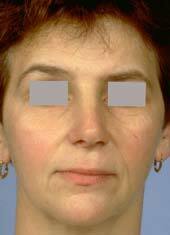 Most frequently , defects are observed in noses that look unnatural and operated on because of certain regularly encountered features : A naso-frontal angle that has not been adequately deepened while the nose was overly shortened ; a dorsum that is overreduced underlining a supra tip deformity , a round nasal tip with no definition. Saddle nose deformity may result from overresection of the nasal hump particularly on septal cartilage but it is also observed in sequellae of a traumatic impact to the nasal pyramid . When the Saddle deformity is the result of the underlying septal cartilage fracture , the correction is done by septoplasty to restore the initial height (see chapter IV ) . But when this saddle deformity is secondary to post surgical tissue loss , such as from excessive resection either within the cartilage or at the dorsal edge , correction calls for an augmentation procedure. -Reconstruction of the dorsum with septal or bone grafts depending on the possibilities of septal harvesting and how crucial the correction of the deformity is. Harvesting conchal cartilage will not provide a sufficiently long fragment. *Flat noses without support of the nasal tip . On examination , the inter-alar base distance appears wide in respect to the length of the columella ; the nasal tip is easily depressed with poor columella support and weak and soft alar cartilages on palpation ; a dorsal depression is caused by excessive septal resection which will require an augmentation rhinoplasty. The goal is not only to correct a dorsal deformity but also to reinforce the columella and tip support with a solid columella strut that is long enough to provide an adequate projection. Fig 1 Middle vault problems result from an excessive resection of the upper lateral cartilages or an aggressive rasping that can cause an avulsion or a disinsertion of the upper lateral cartilages from the nasal bones ; or from an excessive dorsal resection , particularly in a wide nose even if the osteotomies were correctly done. The appearance and extent of the deformity is related to the conditions of skin cover : thin skin , and destruction of the subcutaneous layers during previous operations make the deformities and adhesions more pronounced and more visible , but a thick skin often mask deformities of the underlying skeletal framework. Surgical correction is carried out by using cartilage grafts which play a role of both camouflage and reconstruction , or reinforcement of the skeletal structures :Grafts to the dorsum or placed laterally , " spreader grafts " , and sometimes bone grafts can also be used . Secondary deformities of the nasal base are often caused by excessive and asymetric resections on the alar cartilages , notably in the lateral portions and at the level of the middle crura. - A loss of projection , which may occur after excessive resection , but can also be caused by other factors such as long incisions and extensive undermining . 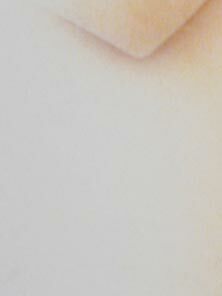 - An asymetry and deformities of the tip lobule . - A collapse and depression of the nasal ala associated with an overresection of the lateral crura that weakens the cartilaginous support of the nasal alae. 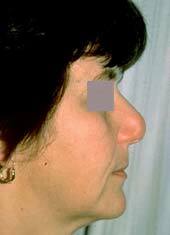 Correction of a short nose is always difficult , whatever primary or secondary rhinoplasty particularly when the covering tissues are scarred and adherent and the mucosal lining is deficient. 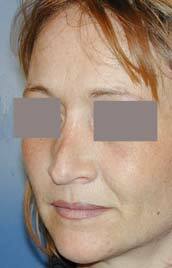 On operated noses , overshortening is often the consequence of excessive resections of the caudal septum and mucosa of the cephalic part of the lateral crura and caudal portion of the upper lateral cartilages and the dorsum . This results in a retraction of the soft tissue envelope over the reduced framework .The naso labial angle will be more opened and the nostrils exposed . 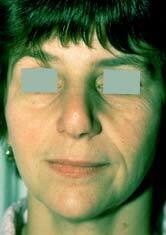 A supra tip deformity and a round tip may be associated to a short nose. The goal of correction is to lengthen by adressing the three structures of the nose ; soft tissues cover , mucosal lining and the underlying skeleton by reconstruction the bony and cartilaginous structures. Certain nasal tips look like they have been amputated because of excessive resection of the alar arch , particularly when this resection involves the domes and the middle crura . The most effective treatment consists of reconstructing the deficient cartilaginous structures by using a combination of cartilage grafts ; these can be superimposed but one can also utilize a construction in a T shaped combination of grafts including a columellar strut and a shield graft. Fig. 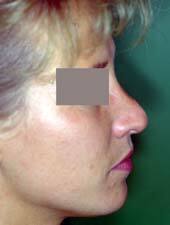 2 Secondary rhinoplasty with overresections of the tip cartilages . Correction was achieved by tip and columella graft greffes cartilagineuses permettant de récupérer une meilleure projection. 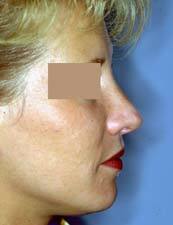 * Problems associated with particularities of the skin ( the " Polly beak deformity The inability of the skin soft tissues to adapt to the new skeletal structures is frequently encountered after rhinoplasty and may result in a supratip deformity deformity which is one of the most obvious signs of a previous nasal operation . 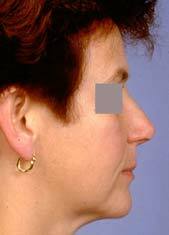 The " Polly beak deformity " is characterized by a supra-tip convexity , situated immediately above the domes ; this convexity appears more pronounced when the nasal bridge is depressed and the nasal tip underprojected . If it is less easy to modify a profile line in the operating room than it is on a screen. * Pinched tip . Alar collapse . The over resection of the lateral crura and the domes can cause pinching of the tip lobule and alar collapse . The degree of this deformity depends on the amount and site of the resections, of the shape and conditions of the lateral crura , but also on the skin conditions . 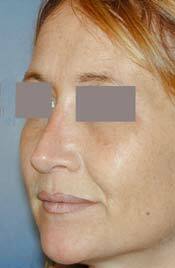 Correction involves a reconstruction of the nasal ala by a fragment of septal or ear cartilage. All these delicate correction are facilitated by the external approach which permits precise positioning of grafts and a better appreciation of the result.